A little over 20 years ago Yamaha Corporation / Music Division, began the quest to build a completely new Concert Grand Piano. Not since 1887, when Yamaha Music Corporation was founded, had they undertaken such a monumental endeavor. No effort, Detail or expense was to be spared in the pursuit of this project. Many, many prototypes were built, and offered to countless artists, symphonies, conservatories and music schools the world over to be be played and evaluated. The piano we have the pleasure of listening to tonight is he result of a 200 million dollar investment and 20 years of research and development. Each and every one of these incredible pianos is hand made and takes a full year to complete. 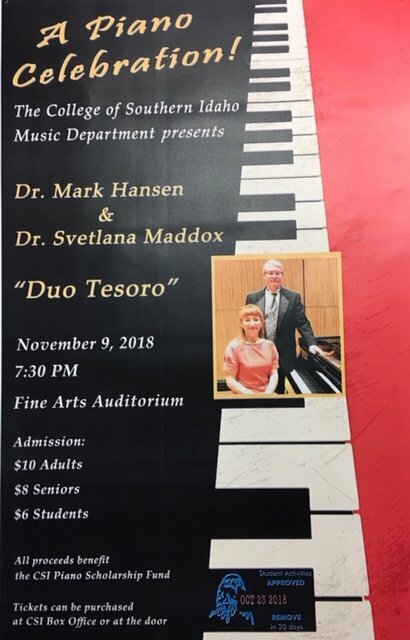 The College of Southern Idaho Music Department invites you to a concert by Dr. Mark Hansen and Dr. Svetlana Maddox presenting "Duo Tesoro" tonight at 7:30 in the Fine Arts Auditorium. Admission is $10 Adults, $8 Seniors, $6 Students. All proceeds benefit the CSI Piano Scholarship Fund.